Our inaugural Bake & Gather For Good Event started with our founding member Zoe Nathan (Huckleberry, Milo & Olive, etc.)! This event was held on a beautiful Saturday morning on February 25th at the Rustic Canyon Recreational Center and Park. We had an incredible turnout and raised $8,200 for The ACLU Souther California & Public Counsel. Our first Bake & Gather For Good Event on the Eastside in Los Angeles! Hosted by Roxana Jullapat (We Are Friends & Family), Harriet Ha (Alimento) and Na Young (Proof Bakery). 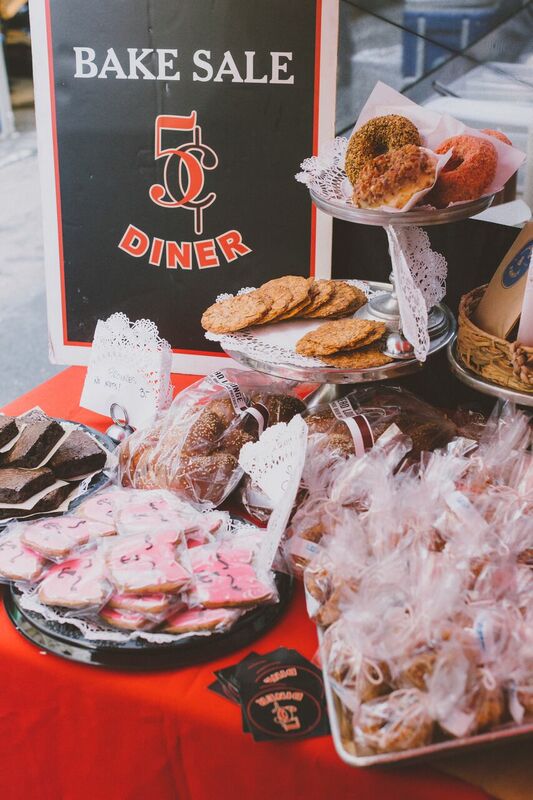 This Bake & Gather featured a raffle for a Kitchen Aid Stand Mixer, a Kid's Fun Run and a tremendous spread of cookies and bars! $3,440 dollars was collected to benefit the ACLU and ProPublica! Featuring a collective of young, talented bakers and chefs including Neidy Venegas, Trang Tran & Debbie Renteria (Rose Cafe), Keely Gonzales & Jessie Liu (Providence), Ivan Marquez (Broken Spanish), Jamie Mejia (Franchelles), Amanda Estrella (Lodge Bread), Lincoln Carson (Pastry Chef), Julia Taylor Brown (Teebsie) and Coffee from Caffe Luxxe. Rain was in the forecast but the sun decided to show up since we were gathering for good! Together we raised $2K in sales alone for ACLU and Watts Community Healing Gardens. Our second edition Bake & Gather featured some incredible powerhouse bakers and chefs who delivered a beautiful spread of cookies, shortbreads, bread loaves, quiche and even a PIE raffle! 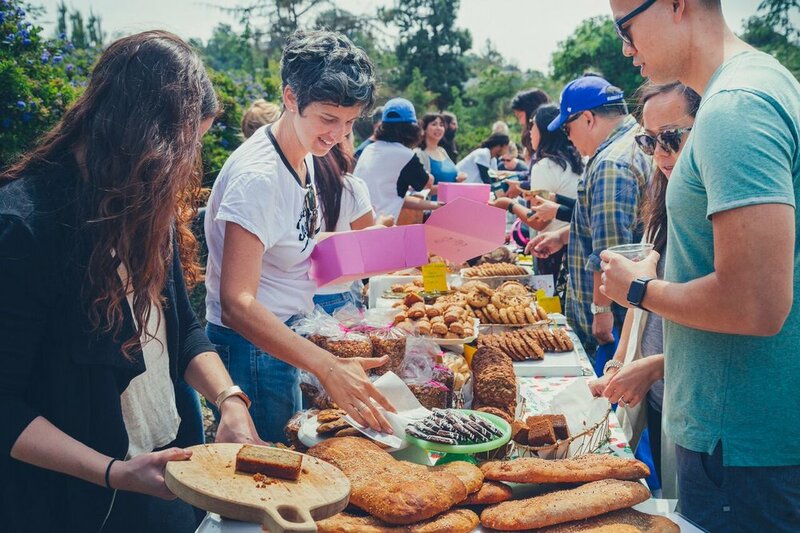 Hourie Sahakian and friends from Bestia, Here's Looking at You, Bub & Grandma's Bread, Caffe Luxxe Coffee and Saffron's Lemonade Stand gathered their community together to raise a serious amount of dough for ACLU & Planned Parenthood! We couldn't have been more excited to see our Bake & Gather pop up in the Jefferson Park community at their beautiful Leslie Shaw Park. Sarah Lange (Bearclaw Kitchen) and her wonderful team baked their hearts out to sell delicious cookies, scones, cinnamon buns and MORE! Special thanks to local City Bean Roasters who donated cold brew for the event. Proceeds were donated to A Sense of Home. On a chilly beautiful Sunday morning, we gathered with Monica May, owner of DTLA's Nickel Diner, as she hosted a sister Bake & Gather event for the Downtown Women's Center. Many contributing bakers from Huckleberry, We are Friends & Family and more provided a beautiful spread of delicious bakes! We were so thankful to be included in Monica's event! We loved working with Deb Dawson, Desserts to Die For, to create a wonderful afternoon at the Bell Arts Factory in Ventura! 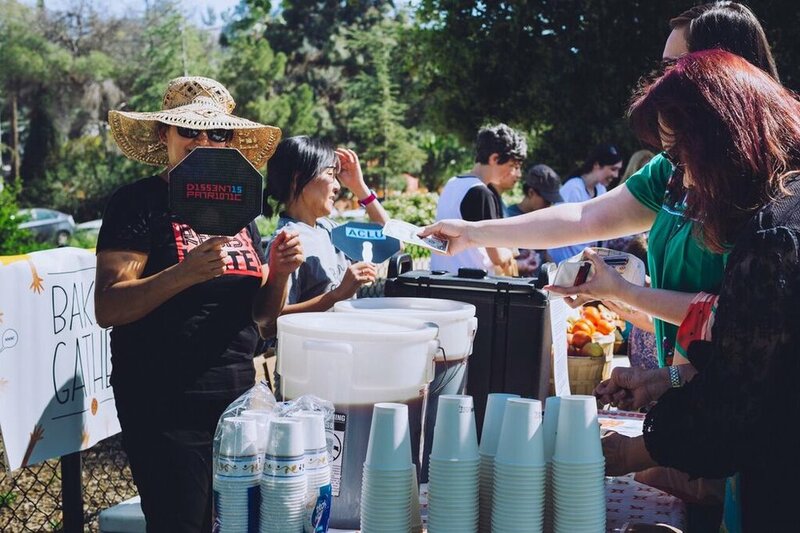 This was so much more than just about the baked goods because there were a ton of local bakers, contributing artists, vendors and even a taco truck! Proceeds were donated to the ACLU and Planned Parenthood. 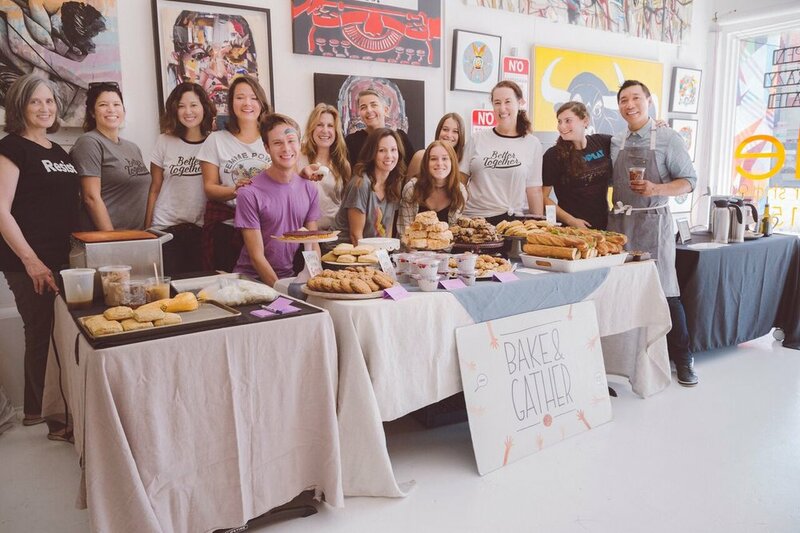 We loved partnering with incredibly talented pastry chefs, Paige Russell from Hatchet Hall, Sasha Piligian with Squirl, Jacqui De Borja of Jodge Bread, and Rose Lawrence of Red Bread along with Menotti's Coffee and Tehachapi Grain Project on the first Bake & Gather in Culver City! It was a wonderful spread of delicious cookies, pies and even whole grain bread and Weiser Farm Carrot cupcakes! In a short 2 hour window, these amazing ladies raised nearly $2500 for United We Dream and the Environmental Defense Fund. We loved working with this powerhouse group of hosts who totally rocked the socks off our Sunday! The insanely talented ladies of Union Restaurant, Lincoln, Little Flower, C'est La Vie and Intellegentsia Coffee partnered together and really brought their A-Game to Pasadena! We sold out in under 3 hours and raised an head spinning $4100 all donated to the local chapter of Planned Parenthood Pasadena / SGV. 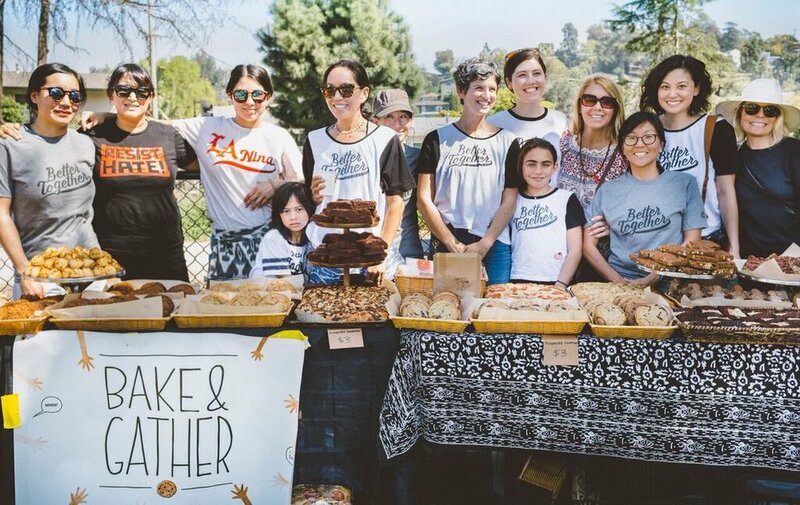 The wonderful ladies behind Cake Monkey Bakery and collaborating photographer/baker Staci Valentine joined together and opened up their LA space for their community to gather for good! Everything in the case was up for grabs and it took all the energy we had to not buy up all those mini-cakes. :) These ladies also had fun face painting for little tots in addition to their delicious treats and coffee. They donated $1700 to MEND Poverty who's mission is to break the bonds of poverty by providing basic human needs and a pathway to self-reliance. 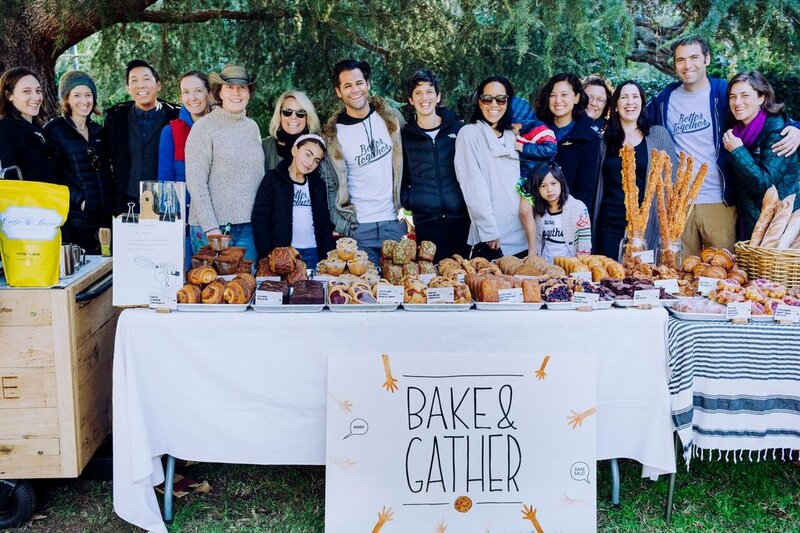 Another fabulous Bake & Gather for Good but this time in Culver City thanks to The Gourmandise School in Santa Monica, Platine Cookies, Tehachapi Grain Project and Caffe Luxxe! These wonderful ladies and gentlemen brought their A-Game to provide the wonderful community insanely delicious croissants, cupcakes, cookies and most importantly... made to order s'mores! In less than two hours we raised $2200 for 826LA: Writing & Tutoring, Food Forward and Tehachapi Grain Project. Jaqui DeBorja of Granddaughter. All proceeds were donated to ACLU & Culinary Corps. 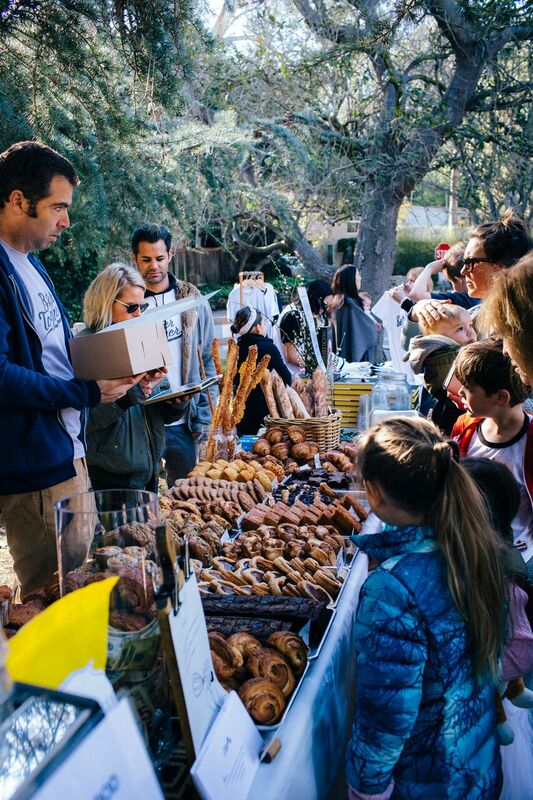 Gather for good brought LA art, pastry and coffee lovers alike together with this wonderful Saturday Bake & Gather. We met at the Wallspace Gallery in Los Angeles where people gathered in a beautiful gallery to admire local LA artists and delicious treats provided by Chef Taji Marie, Ali Talia and Caffe Luxxe. From cookies to baguettes, this group of smiling people didn't stop till the last cookie was sold! Our favorite touch was the inspirational quote signs that Taji and team created. What a wonderful way to spread an important message! All proceeds were donated to support the Westside Children's Center and the ACLU. It's been a crazy ride since our inaugural Bake & Gather event at the Rustic Canyon Recreation Center back in February! With all the heartbreaking events happening around the world, we wanted to bring it back to our community to gather together to support the Hurricane Harvey and Irma victims. Milo & Olive, Huckleberry, The Gourmandise School in Santa Monica and Caffe Luxxe banned together to bring a beautiful spread of delicious pastries, bread and coffee. Even the kids set up a fun lemonade stand to help out! We invited Side Projects to join with their woodworking bus so proceeds could be donated to their efforts for spreading art education for all ages along with Dream Team LA to help spread the word on helping with the recent news on DACA. Proceeds were donated to the Houston Food Bank and UNICEF Disaster Relief. We had a lovely zenfilled day at House of Woo located in the Arts District of DTLA. 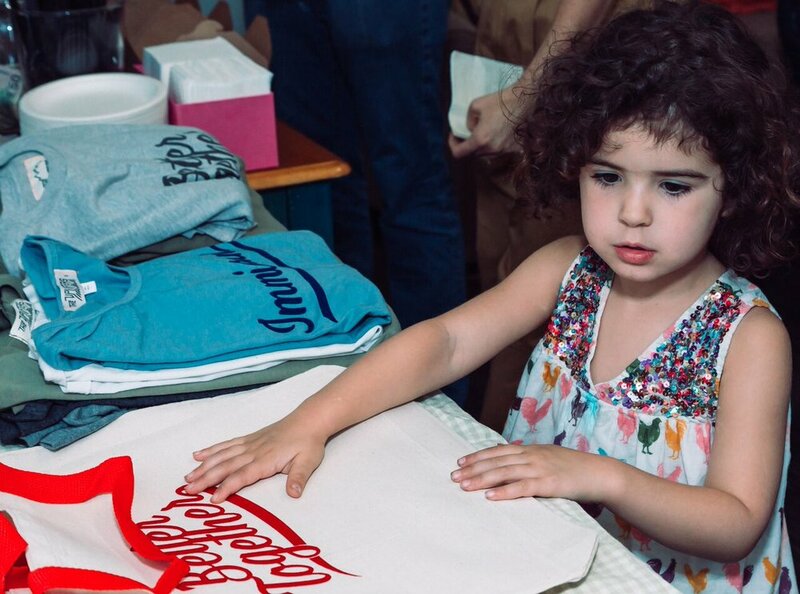 House of Woo is our wonderful partner who designs our Better Together t-shirts and totes. 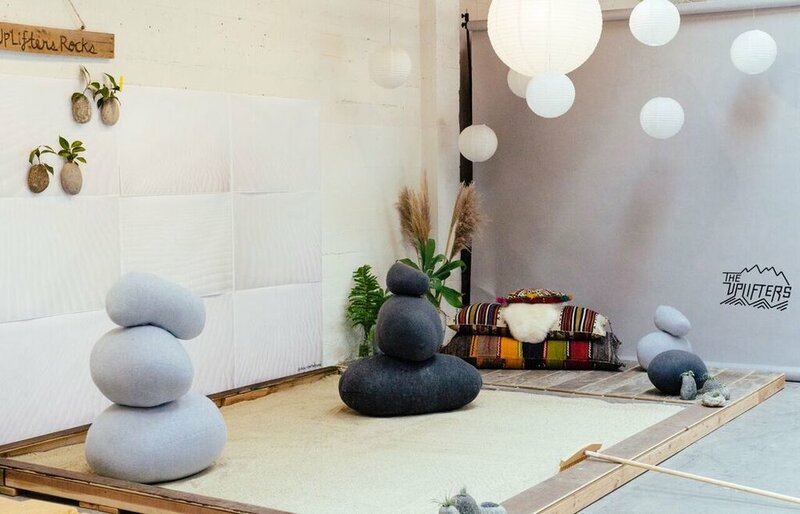 In collaboration with Uplifters Ranch, Annie Free and Alexander Gray, House of Woo, created a special Zen Rock Garden art installation and DIY workshop for adults and kids to reach their inner peace. All proceeds from the rock garden and energy crystals were donated to NAMI (National Alliance on Mental Illness). 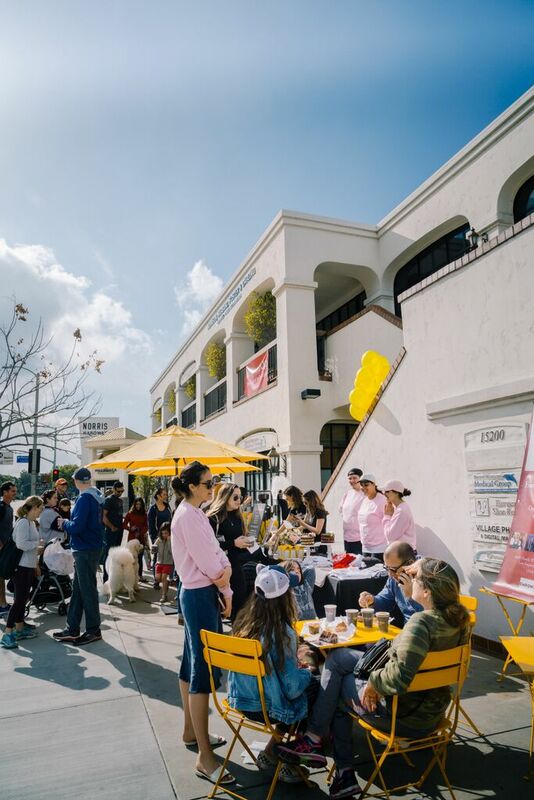 We gathered together on a beautifully sunny day in LA to support the Painted Brain, a non-profit organization addressing mental health challenges through community, the arts, advocacy and enterprise. Thanks to the incredible pastries, food, kombucha, and boutique gifts from our wonderful contributors, we helped them raise over $1600 in 2 hours! Thank you again to our wonderful partners - Farine @karine_jingozian, @westcoastbuckeyes, Chef Tyler Williams @freakinalltime, @HouseofWoo, @depressedcakeshop, @wanterlusthlwd and partner @leynalightman! In celebration of the brand new store opening for our long-time coffee friends at Caffe Luxxe, we decided to host a special event that specifically focused on supporting two very special non-profits that focus on female empowerment! EmpowHer LA and Time's Up. 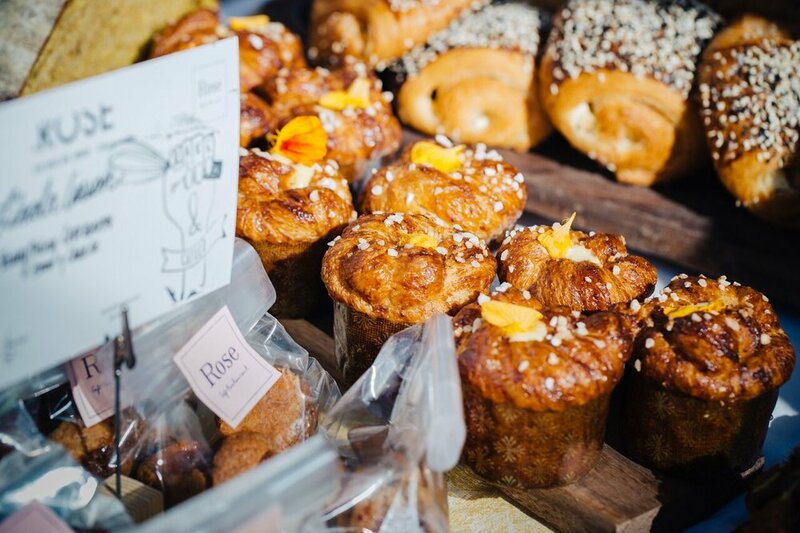 Delicious bakes were provided by the paleo, refined sugar free bakery, Sweet Laurel and Milo & Olive. Together we raised over $2,000! This latest Gather For Good was truly what happens when great people want to bring together their community to do GOOD. Because we have all been hearing too many heartbreaking stories of families being separated, we gathered together to support Public Counsel in this time of need where they are providing pro-bono legal counsel for immigrant families, most of whom don't even speak English. 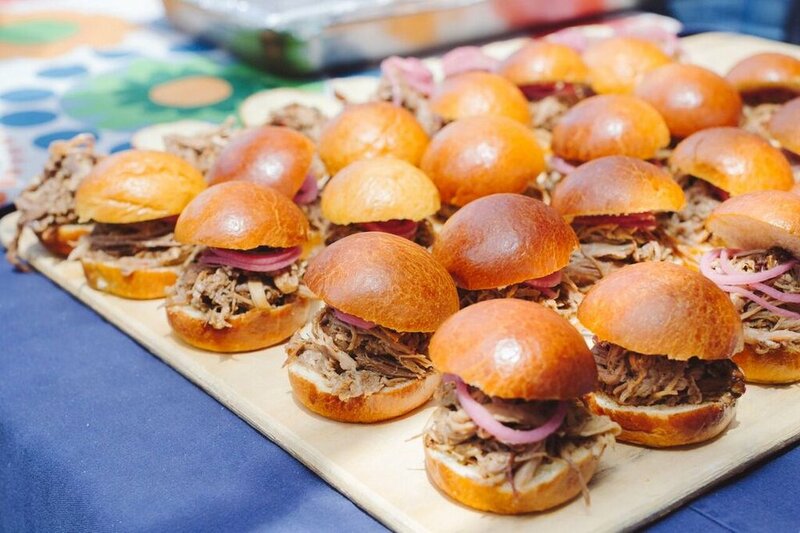 Chef Michelle & Company provided a delicious spread of sopas, tacos and bites straight from her heart. It was a perfectly intimate evening!